After download source code, we import android project (android folder) as a Eclipse project into workspace. Mark this project as a library -> Project Properties -> Android -> is Library (x). * that another person can scan the barcode from your screen. We create other New Android Project. We should link our earlier created library project to new application project. Click right mouse button on project and select Properties. 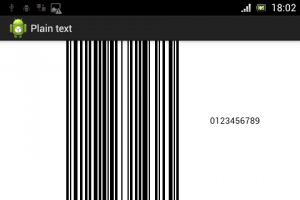 Change tab to ‚Android’ and add our zxing library project as library. We have to copy some codes from Android.manifest file from zxing sources. We need to copy Capture and Encode activity declarations, uses permissions and uses features. Copy them and paste into your app manifest. But our package is different from zxing so we have to fixed activity’s XML attributes name to be compatibile with our library project package (from android:name=”com.google.zxing.client.android.CaptureActivity” instead of „.CaptureActivity”) and android:name=”com.google.zxing.client.android.encode.EncodeActivity” instead of „.encode.EncodeActivity”). We also have to delete or change EncodeActivity’s android:label in our manifest in new project. Create CODE128 using online generator i.e. 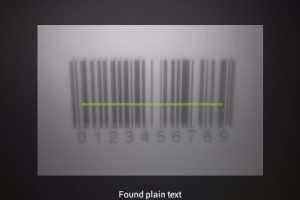 http://www.barcoding.com/upc/ and scan using our example app. 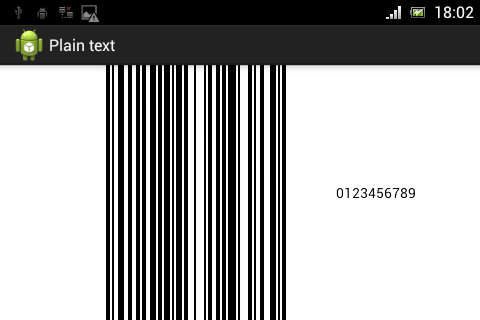 After scanning you should get the same CODE128 like this online generated one. 4- In our project Go to Properties -> Java Build Path -> „Order and Export” Then order the core.jar to the first position and select it! well that work for me.